Gasoline is a nonrenewable fuel made from petroleum. Refineries only produce about 20 gallons of gasoline from every 42-gallon barrel of crude oil that is refined. The rest of the barrel gets turned into other petroleum products like diesel fuel, heating oil, jet fuel, and propane. Gasoline or petrol is a petroleum-derived liquid mixture consisting mostly of aliphatic hydrocarbons and enhanced with aromatic hydrocarbons toluene, benzene or iso-octane (non-aromatic) to increase octane ratings, primarily used as fuel in internal combustion engines. Most Commonwealth countries or former Commonwealth countries, with the exception of Canada, use the term "petrol" (abbreviated from petroleum spirit). The term "gasoline" is commonly used in North America where it is often shortened in colloquial usage to "gas". This should be distinguished in usage from genuinely gaseous fuels used in internal combustion engines such as liquefied petroleum gas (which is stored pressurized as a liquid but is allowed to return naturally to a gaseous state before combustion). The term mogas, short for motor gasoline, distinguishes automobile fuel from aviation gasoline, or avgas. 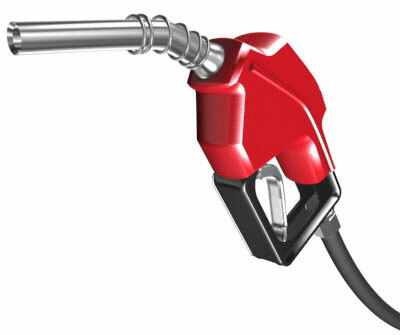 Gasoline is a complex mixture of over 500 hydrocarbons that may have between 5 to 12 carbons. Smaller amounts of alkane cyclic and aromatic compounds are present. Virtually no alkenes or alkynes are present in gasoline. Gasoline is most often produced by the fractional distillation of crude oil. The crude oil is separated into fractions according to different boiling points of hydrocarbons of varying chain lengths. 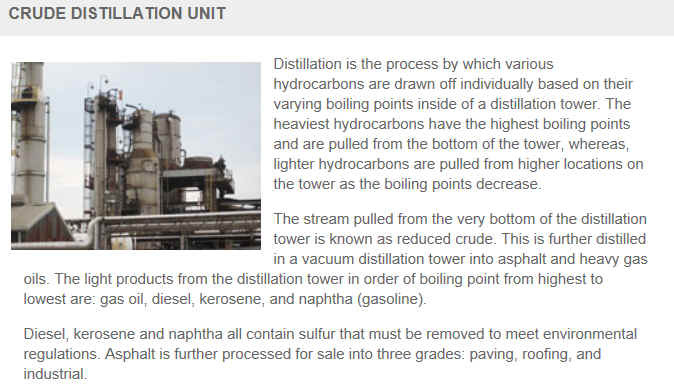 This fractional distillation process yields approximately 25% of straight-run gasoline from each barrel of crude oil. Before internal-combustion engines were invented in the mid 19th century, gasoline was sold in small bottles as a treatment against lice and their eggs. At that time, the word Petrol was a trade name. This treatment method is no longer common, because of the inherent fire hazard and the risk of dermatitis. Gasoline was also sold as a cleaning fluid to remove grease stains from clothing. The name gasoline is similar to that of other petroleum products of the day, most notably petroleum jelly, a highly purified heavy distillate, which was branded Vaseline. 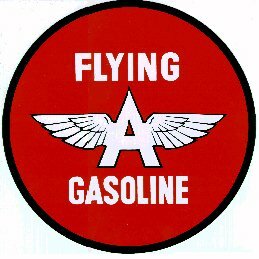 The trademark Gasoline, however, was never registered, and thus became generic. 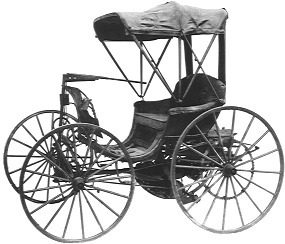 The invention and development of the automobile as primary mode of personal transportation required a parallel development of the fuels that would power the automobiles. Hydrocarbon fuels were an integral component of society in the 19th century as a source of light. Coal gas, camphene, kerosene from the petroleum in the ground all competed to light the lamps of the cities and the country. Automobile engines demanded unprecedented amounts of petroleum. The early refiners could convert only a small proportion of their crude oil to gasoline - the rest was wasted or spilled to the environment. During the 1910s, laws prohibited the storage of gasoline on residential properties, so Charles F. Kettering modified an IC engine to run on kerosene. However the kerosene-fuelled engine would "knock" and crack the cylinder head and pistons. He assigned Thomas Midgley Jr. to confirm that the cause was from the kerosene droplets vaporizing on combustion as they presumed. Midgley demonstrated that the knock was caused by a rapid rise in pressure after ignition, not during preignition as believed. This then lead to the long search for antiknock agents, culminating in tetra ethyl lead . Typical mid-1920s gasoline were 40 - 60 Octane . 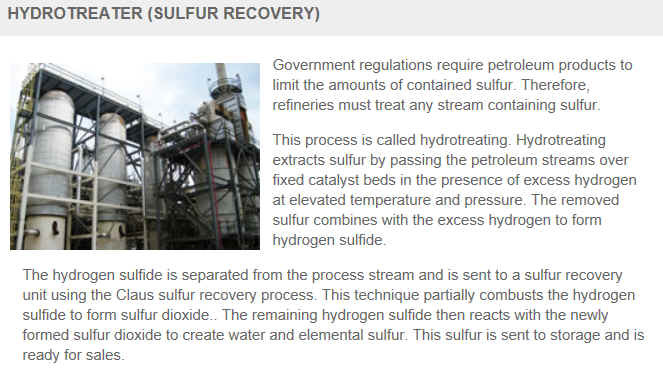 Because sulfur in gasoline inhibited the octane-enhancing effect of the alkyl lead, the sulfur content of the thermally-cracked refinery streams for gasoline was restricted. By the 1930s, the petroleum industry had determined that the larger hydrocarbon molecules (kerosene) had major adverse effects on the octane of gasoline, and were developing consistent specifications for desired properties. By the 1940s catalytic cracking was introduced, and gasoline compositions became fairly consistent between brands during the various seasons. The 1950s saw the start of the increase of the compression ratio, requiring higher octane fuels. Octane ratings, lead levels, and vapor pressure increased, whereas sulfur content and olefins decreased. 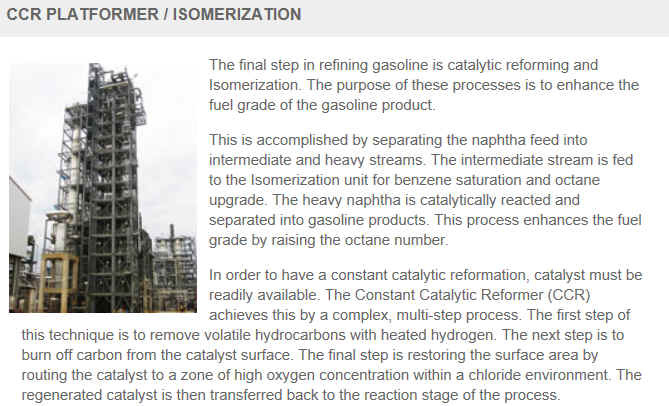 Some new refining processes ( such as hydrocracking ), specifically designed to provide hydrocarbons components with good lead response and octane, were introduced. 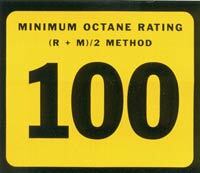 Minor improvements were made to gasoline formulations to improve yields and octane until the 1970s - when unleaded fuels were introduced to protect the exhaust catalysts that were also being introduced for environmental reasons. From 1970 until 1990 gasoline was slowly changed as lead was phased out, lead levels plummeted, octanes initially decreased, and then remained 2-5 numbers lower, vapor pressures continued to increase, and sulfur and olefins remained constant, while aromatics increased. A filling station, fueling station, gas station, service station or petrol station is a facility which sells fuel and lubricants for motor vehicles. But The most common fuels sold are gasoline (petrol) or diesel fuel. Some stations carry specialty fuels, such as liquified petroleum gas (LPG), compressed natural gas (CNG), hydrogen, biodiesel, ethanol, or kerosene. In recent times, filling stations have also begun to sell butane and have added shops to their primary business; convenience stores are now a familiar sight alongside pumps. 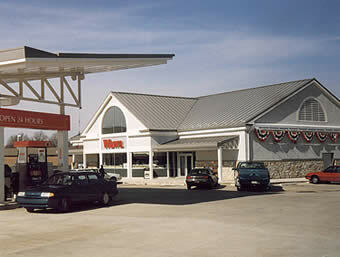 The term "gas station" is mostly used in the Western Hemisphere, including the United States and Canada, where the fuel is known as "gasoline" or "gas". 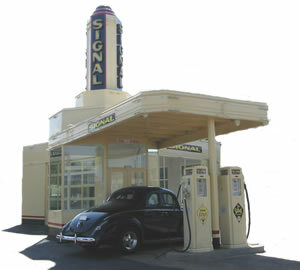 The world's first purpose built gas station was constructed in St. Louis, Missouri in 1905 at 412 S. Theresa Avenue. 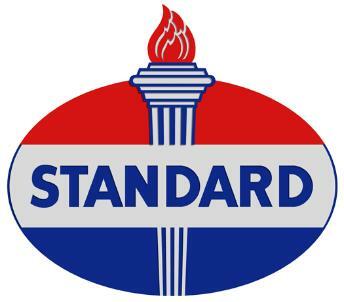 The second gas station was constructed in 1907 by Standard Oil of California (now Chevron) in Seattle, Washington. Reighard's gas station in Altoona, Pennsylvania claims that it dates from 1909 and is the oldest existing gas station in the United States. Early on, they were known to motorists as "filling stations". Gasoline is made from crude oil. Refineries take crude oil and break down its hydrocarbons into different products, called “refined products,” including gasoline, diesel fuel, heating oil, jet fuel, liquefied petroleum gases, and residual fuel oil. The characteristics of the gasoline depend on the type of crude oil that is used and the setup of the refinery at which it is produced. Gasoline characteristics are also impacted by other ingredients that may be blended into it, such as ethanol. The status of gasoline changed dramatically, when Charles Duryea in 1892 built the first gas-powered automobile in the United States. Today, refineries turn more than half of every 42-gallon barrel of crude oil into gasoline. This is a remarkable advance from 70 years ago when each barrel of crude yielded only 11 gallons of gasoline. There are three basic steps common to all refining operations, whether big or small, simple or complex. First, the separation process separates crude oil into various chemical components. Next, the conversion process goes a step further by breaking these chemicals down into molecules called hydrocarbons. Lastly, the treatment process combines and transforms hydrocarbon molecules, and other chemicals called additives, to create a host of new products. Separation starts by pumping crude oil into pipes running through hot furnaces and heating the oil to vaporize it. The resulting vapors and liquids are discharged into distillation towers, the tall, narrow columns that give refineries their distinctive skylines. Inside the towers, the liquids and vapors separate into components or fractions according to their density and boiling point. The lightest fractions, including gasoline and liquid petroleum gas (LPG), vaporize and rise to the top of the tower, where they condense back to liquids. Medium-weight liquids, including kerosene and diesel oil, stay in the middle. Heavier liquids, called gas oils, separate lower down. The heaviest fractions with the highest boiling points settle at the bottom. 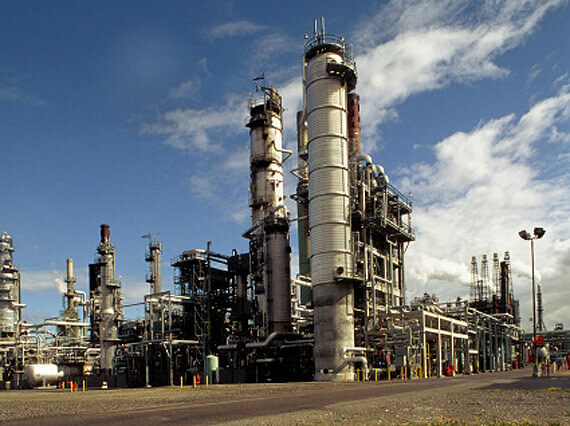 The various fractions are then piped to different stations or plants within the refinery. Some fractions require relatively little additional processing to become road asphalt or jet fuel. However, fractions destined to become high-value products, such as gasoline, typically require much more additional processing. Conversion is where fractions from the distillation towers are transformed into streams (intermediate components) that eventually become finished products. The most widely used conversion method is called cracking, which uses heat and pressure to literally "crack" heavy hydrocarbon molecules into lighter ones. A cracking unit consists of one or more tall, thick-walled, bullet-shaped containers, called reactors, and a network of furnaces, heat exchangers, and other vessels. Fluid catalytic cracking, or "cat cracking," is the basic gasoline-making process. Using intense heat (about 1,000 degrees Fahrenheit), low pressure and a powdered catalyst (a substance that accelerates chemical reactions), the cat cracker can convert most relatively heavy fractions into smaller gasoline molecules. 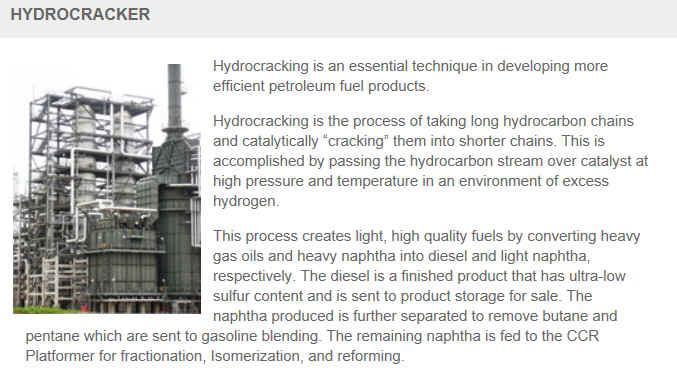 Hydrocracking applies the same principles but uses a different catalyst, slightly lower temperatures, much greater pressure and hydrogen to obtain chemical reactions. Although not all refineries employ hydrocracking, Chevron is an industry leader in using this technology to cost-effectively convert medium- to heavyweight gas oils into high-value streams. The company's patented hydrocracking process, which takes place in the Isocracker unit, produces mostly gasoline and jet fuel. 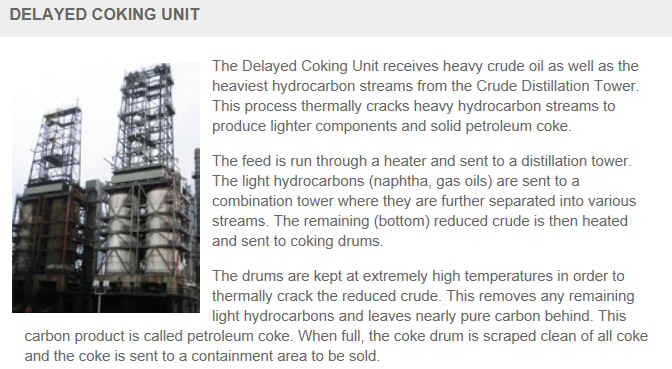 Some refineries also have cokers, which use heat and moderate pressure to turn residuum into lighter products and a hard, coallike substance that is used as an industrial fuel. Cokers are among the more peculiar-looking refinery structures. They resemble a series of giant drums with metal derricks on top. Cracking and coking are not the only forms of conversion. 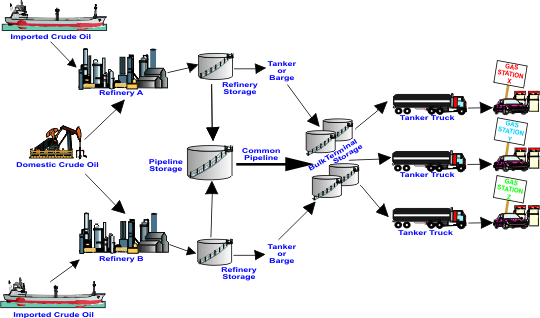 Other refinery processes, instead of splitting molecules, rearrange them to add value. Alkylation, for example, makes gasoline components by combining some of the gaseous byproducts of cracking. 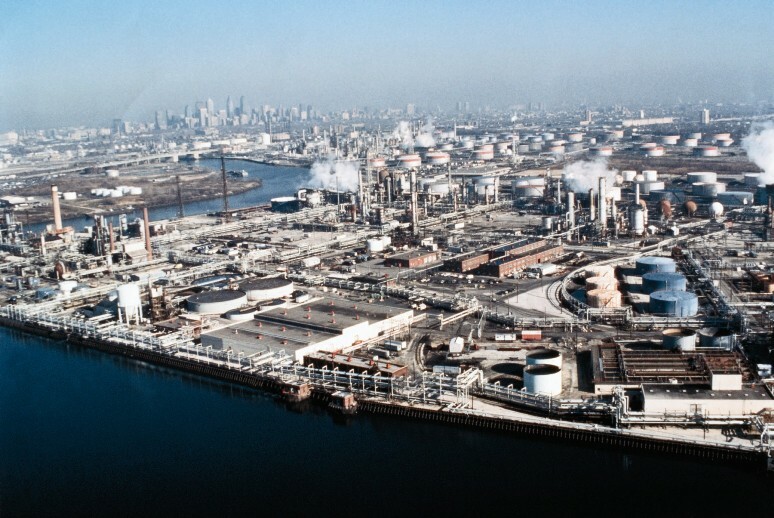 The process, which essentially is cracking in reverse, takes place in a series of large, horizontal vessels and tall, skinny towers that loom above other refinery structures. Reforming uses heat, moderate pressure, and catalysts to turn naphtha, a light, relatively low-value fraction of the oil, into high-octane gasoline. Treatment is the final step before tanker trucks and railroad cars head out of the refinery to deliver gasoline to our local gas station.A major part of modern refining involves blending, purifying, fine-tuning and otherwise improving products to meet these requirements. To make gasoline, refinery technicians carefully combine a variety of streams from the processing units. Among the variables that determine the blend are octane level, vapor pressure ratings, and other special considerations, such as whether the gasoline will be used at high altitudes. Technicians also add patented performance additives, and dyes to distinguish the various grades of fuel.